Smartphones have large screens and allow us to play games and watch movies, but it seems as though smartwatches are quickly moving into "smartphone alternative" territory. There's some logic to this: after all, smartwatches are far more portable than smartphones, and no matter how thin and light we make smartphones, smartwatches can't be beat in the thin, light, and portable department. Appfour has brought us a Documents for Android Wear app that lets you read Google Drive files and PDFs on the tiny screen, but the company is not yet done with adding wrist entertainment: its latest feat is its new Video Player that lets you watch your own videos and see photos from your own photo galleries on the wrist as well. The new Appfour Video Player also provides volume and headphone controls too, so that you need not disturb others while you're sitting in the doctor's office waiting for that routine checkup. The world has never had a shortage when it comes to new and experimental ideas, and Appfour definitely provides some nice apps for Android Wear users. 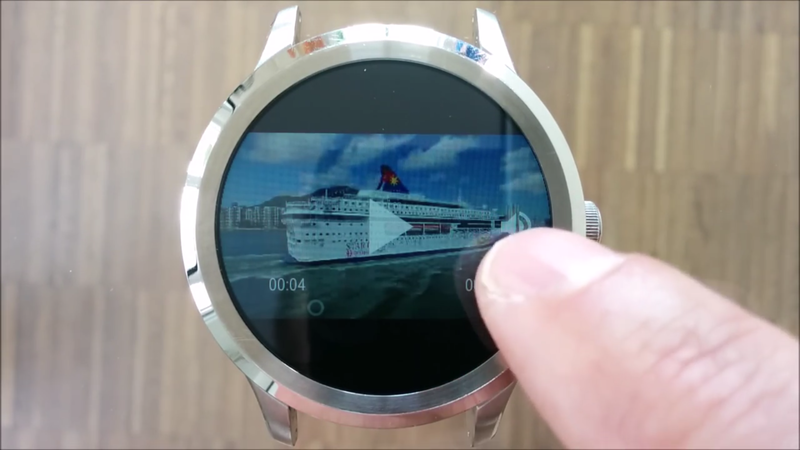 We know that some will find the new Appfour Video Player to be a bit "over the top," but somewhere out there, some Android Wear user is thanking his or her lucky stars that the company is willing to "think outside the box" -- or, in this case, the circle. Take a look at Appfour's Video Player via the YouTube video below.